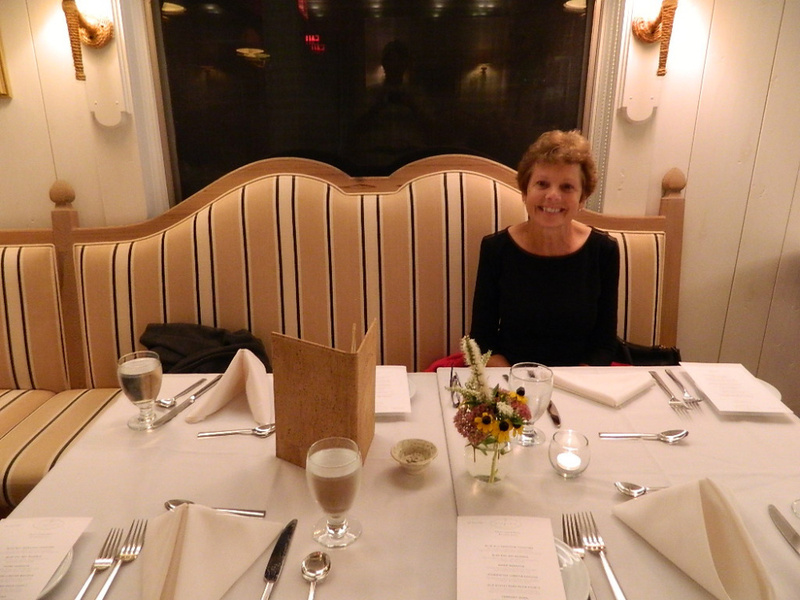 I certainly had been looking forward to a special meal at Aragosta in Stonington, but little did I realize that this would be the dining experience of my lifetime. This year, Aragosta chef Devin Finigan created a chef’s tasting menu in lieu of a traditional menu. 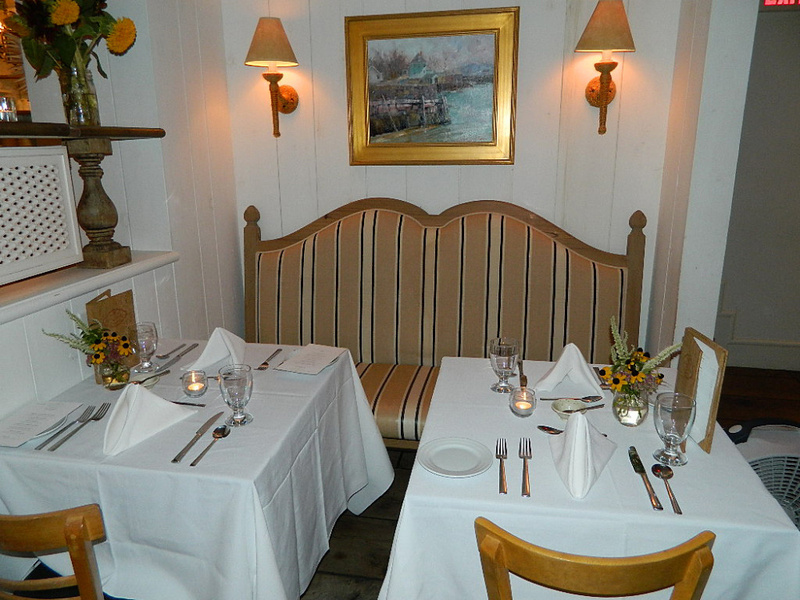 They book diners for specific times so that the restaurant can serve the many courses at similar times. Seven courses plus a couple of surprises requires an orchestrated plan. Alas, the restaurant is closed for the winter. After it reopens in early June, you can enjoy a special lunch menu out on the deck overlooking the ocean in addition to the evening’s Tasting Menu in the dining room. Be sure to get a reservation. A friend of mine had recently been to Stonington and was shocked to see how much food was on this menu. “I don’t know how anyone could eat all that food,” she remarked. 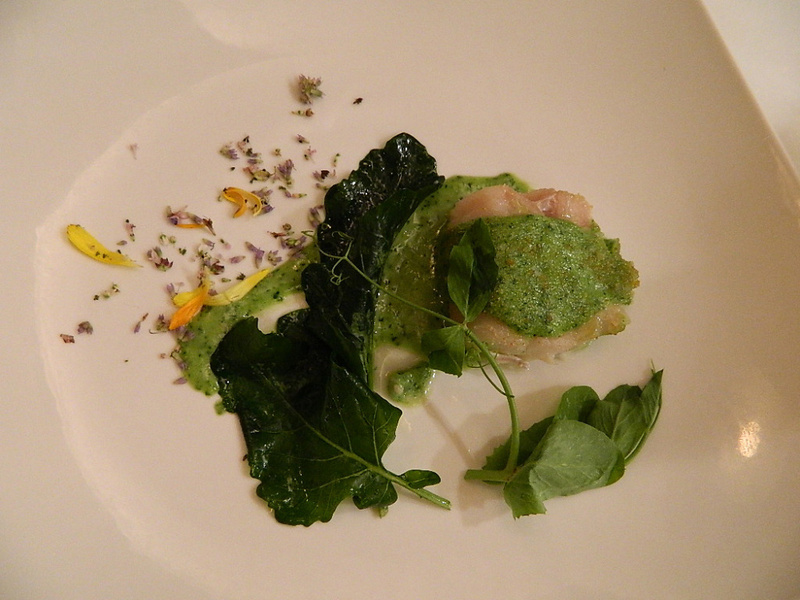 But the chef prepares small, delicate portions created with extraordinary artistry and care. We dined with friends Rusty and Sue Atwood, and all agreed that it was the perfect amount of food. We photographed, oohed and aahed over each spectacular morsel over our two-hour dining experience. We were sated, not overstuffed. 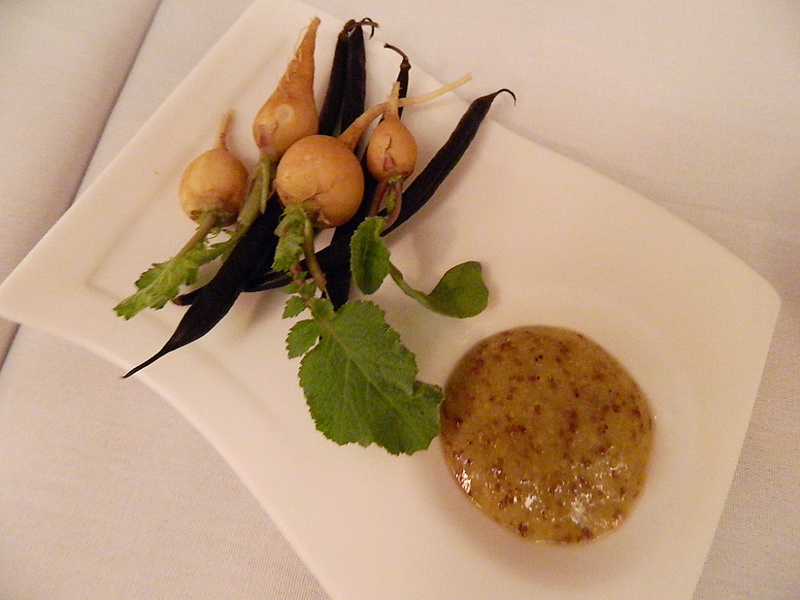 From the outset — a starter of perfect unique baby vegetables served with a mustard sauce — we were taken with the presentation of our food. Their housemade breadsticks, served standing tall in a tin container, were to die for. Amazing on their own, they were even better with herbed butter. When the server brought more, we did not decline. Next came Blue Hill heirloom tomatoes. Sunflower shoots, something new for me, along with garlic pesto and egg yolk, were shaved over the top. We all went crazy over the crispy shallots. This dish was light, delicate and full of seasonal flavors. I thought I’d be skipping over the Blue Hill Bay mussels course, not being a big fan of seafood. But they were extraordinarily prepared with a summer soffrito combined with a lobster and white wine broth. It certainly tempted me to try these baby mussels and I’m so glad I did. They were sweet and tender. George is always saying that it’s the broth that makes the mussels so good, and that, combined with their tenderness, won me over. George couldn’t believe it when I said I enjoyed the Maine haddock. I think he’d been counting on eating mine. It was topped with lemon breadcrumbs and arugula aioli and was the first time I’ve ever liked haddock. Sue and I discovered that we loved the Spagarelli — it’s an Italian green with a bitter taste that really worked well with the fish. So I was two-for-two on seafood and, wouldn’t you know, the lobster course won me over as well. 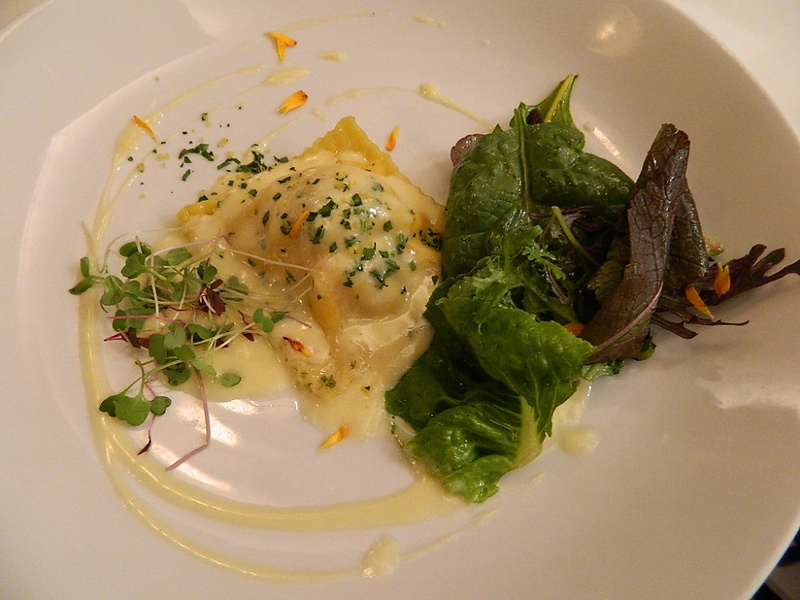 The Lobster Raviolo (I learned that one of ravioli is called a raviolo), was much awaited by all the diners, as this is the chef’s signature dish. 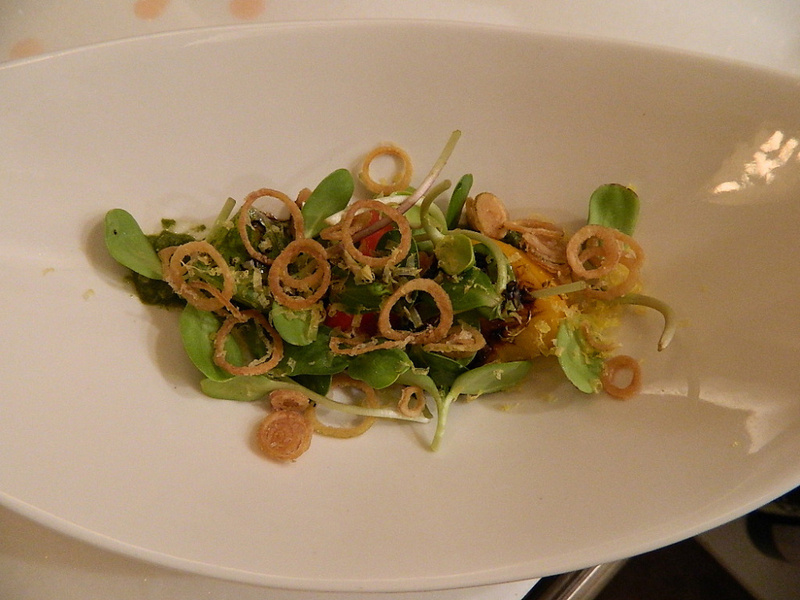 Mesclun, citrus beurre blanc and micro-greens supported the perfectly cooked pasta. The lobster inside was simply prepared and the nice lemony flavor didn’t overpower the star of this plate. I ate every bit and it was indeed amazing. Next came a terrific Old Ackley Farm duck confit. Perfect potato gnocchi, toasted pecans, arugula and apples blended with the deep rich flavor of the duck. At this point, it was truly impossible to choose a favorite dish. “Oh, that smells good!” Sue exclaimed as the Vermont quail arrived. 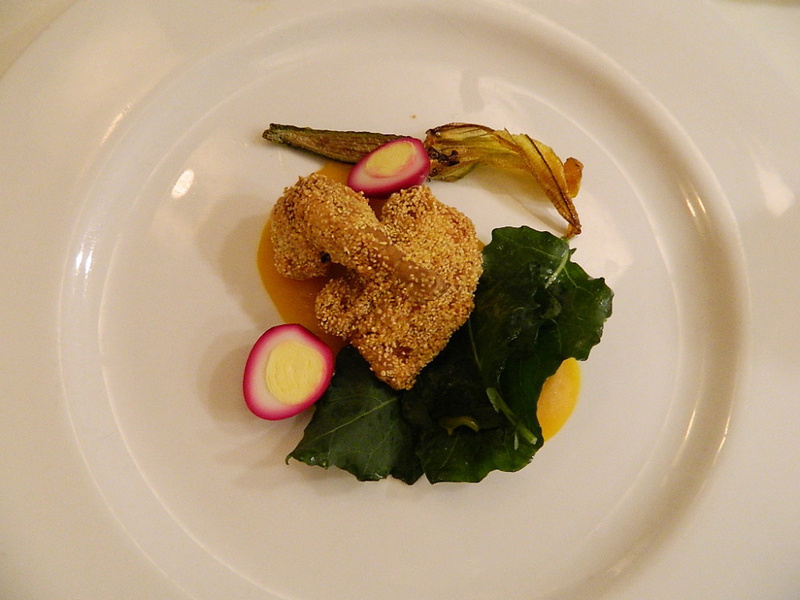 It looked like miniature portions of fried chicken, but these were dusted with polenta and served over amber squash puree. A baby quail egg pickled in beet juice and a baby zucchini with it greens still attached almost stole the show on this one. Sue and I were happy to see chocolate included in our dessert. 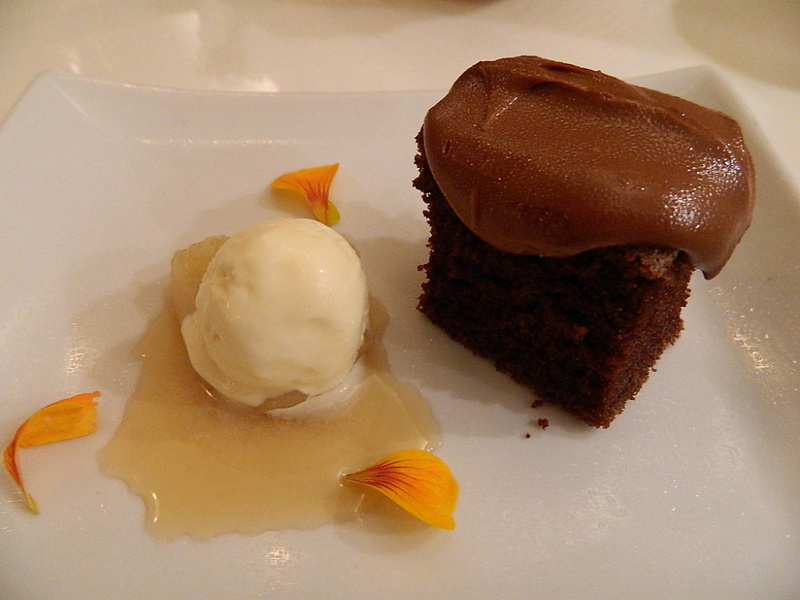 A sliver of chocolate fudge cake accompanied a poached pear and ginger ice cream. Heaven. What a memorable meal this was! If you are a diner who truly appreciates food, are ready to be dazzled by spectacularly presented dishes and want to experience intricate flavors, put Aragosta and its tasting menu on your docket for next summer. Well, I guess you can tell that Linda loved this dinner. So did I, but she left me no room to tell you why. Well, here’s what I can add: the interior of the restaurant is stunningly beautiful, with large windows overlooking the ocean. Most of their produce comes from Maine farms and fishermen. Every dish was creatively unique and delicious. And yes, I was wickedly disappointed that Linda ate every bit of her seafood dishes. That was truly unprecedented and amazing. The staff, including our servers Jenny and Sadie, were personable and well-educated on all the dishes. We loved hearing Sadie describe the dishes in great detail. The experience was enhanced by the clearing of tableware after every course. We also recommend sharing this great experience with friends. Rusty and Sue made this a special and memorable evening for us. I’d be hard-pressed to choose a favorite dish, honestly. I did especially love the mussels and lobster raviolo — and the fact that every dish was a learning experience, at least for me. Priced at $75 per person, this experience is a real bargain. It’s now on our short list of dining experiences we will want to enjoy every year.